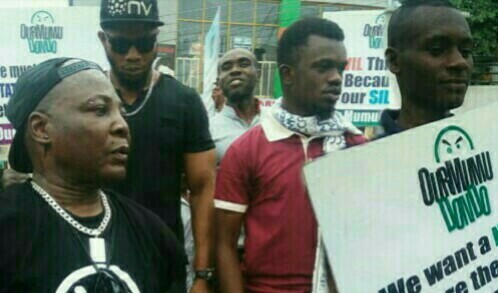 OurMumuDonDo Movement led by Charles Oputa, aka, Charly boy, says it is utterly dismayed by the “self-seeking and vainglorious” declaration of President Muhammadu Buhari to seek second tenure. Their reaction is contained in a statement co-signed by Adebayo Raphael, Deji Adeyanju, Ariyo Dare Atoye and Bako Abdul Usman. The group said the declaration reeks of the unapologetic demeanor of the All Progressives Congress (APC) and President Buhari, despite the monumental failure of the current Nigerian administration. It reads: “At a time when the unemployment rate is pegged at 18.8%; when Nigerians are heartbreakingly dying in their thousands in the face of insurgency and unrest; when the free falling of the economy is making life precariously uncomfortable for the common people, the least the President Buhari’s administration could do is resign honorably. “However, President Buhari and the bootlickers around him have failed to admit that leadership is not a game of grandstanding but an undertaking for solving problems. “Obviously, the plan of president Buhari and his political party is to irredeemably ruin Nigeria and further subject Nigerians to a life of hardship and innumerable crises. “By failing to competently resolve the Boko Haram Insurgency, the Fulani Herdsmen crisis, the senseless kidnapping of innocent citizens, the unending economic misadventure, among other national tragedies besetting the country, President Buhari and his party have not only failed to display competent leadership, but have also failed to be remorseful for their failure. “This arrogant, unsympathetic, and self-serving impunity must be punished by all well-meaning Nigerians at the polls in 2019. “OurMumuDonDo Movement abundantly condemns and rejects the reelection declaration of President Muhammadu Buhari, and we wish to state unequivocally that we shall persistently, albeit non-violently, demand a better deal for Nigerians come 2019. “We wish to state emphatically, that in an era when the world is speedily gravitating towards youthful, innovative, and visionary leadership, Nigeria must completely reject the recycling of deceptive, primitive, incompetent, ailing, power-intoxicated and arrogant geriatrics whose only mission in governance is to sabotage the nation, plunder our commonwealth, and endlessly ramify the masses.